But I’ve never seen any around my house. The books my person has are all worm free. So I guess Gizmo – the cat that moved in here recently – figures it’s a free for all. He’s got no competition from worms. So he’s going to be the world’s first book cat. Thanks Little Binky. Maybe Gizmo should have some glasses too – but I don’t think they’d fit him. Chancy and Mumsy, I don’t think Gizmo found any books he wanted to read – so he pushed a couple of them off the shelf and left. Hugs and nose kisses back to you. Maybe Gizmo is putting worms in the BOOKS! /gasp! Kimberly, I’d better go check those books now. There are books all over this house and I wouldn’t want the worms to multiply. Gizmoooooo! It would be just like Gizmo to put something that could multiply like rabbits. Lily & Edward, if those worms show up I’m chasing them out of the house. Bella and Beary, you are so right. You’re lucky you don’t have to live with two of them. I think I like a book-cat better than a book-worm. I’m not a fan of worms. 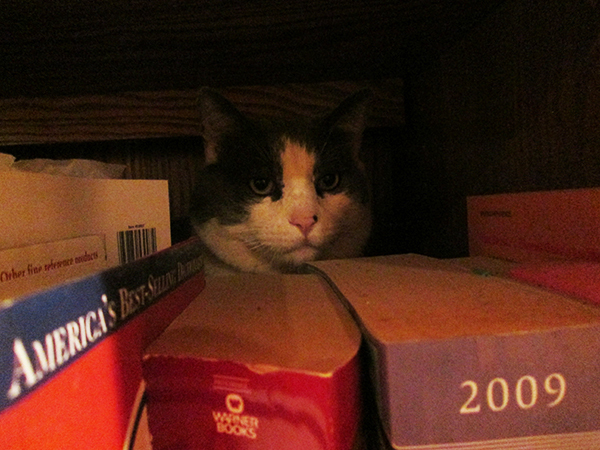 Cupcake, maybe I should make that book-cat stay on the shelf. You look quite studious Bongo! Gizmo understands how good books smell and how fun they are to hide behind! Ralphie and I love them too! Marty, I guess I never thought about hiding behind books because the shelf is too small for me. And Scratchy, the other cat I live with, never does that either. His favorite place to hide is the top of the kitchen cabinets. 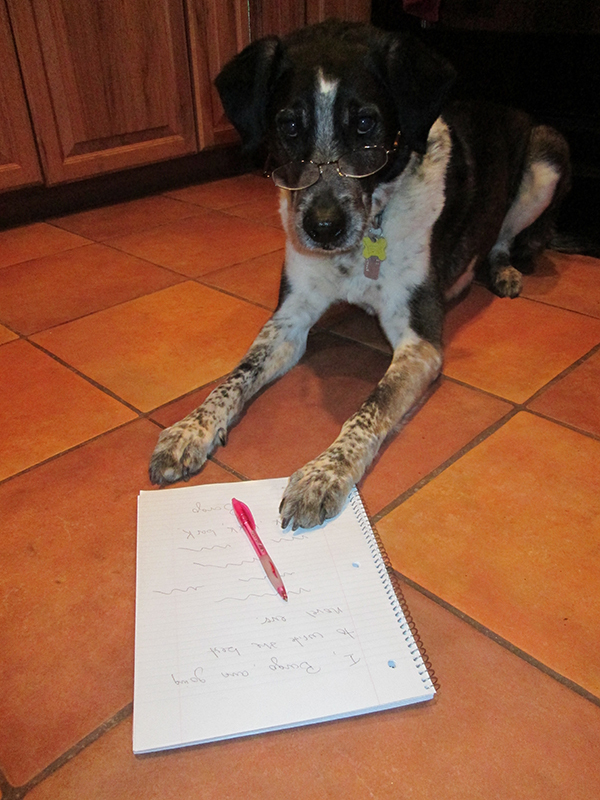 Marina, Gizmo will never be as wise as me – but in order to make sure I’m going to keep doing things to get even wiser. you should sneak up on them the way they sneak up on you and tell them that was a ghost story played out in real life WOOOOOOF! Great idea Fredrieka. Somehow those cats always know when I’m coming though. Angel Kevin, Gizmo is definitely a character.